Mockingbirds don’t do one thing but make music for us to enjoy. They don’t eat up people’sgardens, don’t nest in corncribs, they don’t do one thing but sing their hearts out for us. That’s why it’s a sin to kill a mockingbird. Sissy Spacek narrated the audiobook version of To Kill a Mockingbird, by Harper Lee, and I think it’s the most beautiful book I’ve ever listened to. This was my first book for Maggie’s Southern Reading Challenge, and it was a powerful experience! It’s a beautifully-told story about growing up, takes place in Alabama during the Great Depression, gives a warm and intimate view of life in a small town (then and now), and deals with the very painful issues of racism and poverty. But most of all, it’s a story about love. The story is told through the eyes of “Scout” (Jean Louise Finch), so you feel as though you are part of the family as she and her brother, Jem, grow and experience life with their father, Atticus, in Maycomb, Alabama. I fell in love with Atticus Finch when I first read this book, and later saw the film starring Gregory Peck, many years ago. I was captured by his intelligence and integrity, his compassion and humanity, and his complete and unconditional love for his children. He reminded me of my own father in many ways, and he must have helped set a standard for the husband I would meet and marry 38 years ago, because he, too, shares many of those same quiet qualities. This audiobook performance by Sissy Spacek is outstanding. According to Maggie, it’s been nominated for a Quill Award, and rightly so! For all those students that are required to read this Pulitzer Prize winning novel, I would highly recommend having the book in hand, but also listening to this incredible performance/reading at the same time. Hearing that beautiful language spoken by such a talented performer deepens the cultural experience of the book, and I think would help young people better understand the complexities of the story. I believe one of the major reasons we have a whole genre named after our region is because “sense of place” or the setting, becomes a character in most Southern books. I want to bring this to your challenge experience! To Kill a Mockingbird is a wonderful way to experience this strong sense of place, and was a perfect choice for the beginning of this reading challenge for me. You never really understand a person until you consider things from his point of view–until you climb inside his skin and walk around in it. This entry was posted in Challenges, Fiction on June 18, 2007 by Robin. That’s a very lovely review. I will be reading this book for the Book Awards Challenge. I’ll see if I can’t find the book on tape. I love Sissy Spacek and have heard so many beautiful things about the book that I can imagine the two together would be a perfect union. Thanks, Petunia! It is a lovely work of art (the combination of the writing and the narration). It brought me to tears many times. How lovely of a discussion, and I do plan to use your thoughts in my next post. Someone else just finished it, too. So, I want to hook y’all up. Oh wow, Robin. I just finished this one a few hours ago, and I am speechless. Your review is wonderful, and it conveys many of the things I felt but couldn’t articulate. It is indeed a very powerful book, and I’m so very glad to have read it at last. Beautiful review! This is one of my favorite books of all time. I’ve never heard the audio edition, but will get it now with your recommendation. My son is 11, and I’m considering reading this with him. He’s pretty mature, so I think he can handle it. What are your thoughts about a kid going into 6th grade reading it? I love mockingbirds, too, they’re all over the place here and they imitate car alarms, which makes me laugh! Thanks Maggie! Good luck with getting a photo of your mocker…it’s hard to get good bird shots. 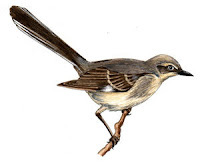 I hope the photo I posted is truly a mockingbird…I’ve never seen (or heard) one, but I’d love to sometime! I’m glad you liked it, too, Nymeth. I remember that it was a book I really liked when I first read it long ago, but this listening experience was sensational. The movie is arriving in the mail tomorrow, so I’m going to revisit that experience, too. Gentle Reader, I think listening to this version, (and having the book to follow along with and refer to), and then really talking together about the tough emotional parts, would be a wonderful shared experience with your son. Sissy Spacek’s performance would make the book much more understandable for him than just reading it at his age. This book is so dear to my heart. It makes you think about the worth of life and humanity. It is never an insult to be called what somebody thinks is a bad name, especially when one is defending a good cause against mendacious testimony. It just shows how poor and piteous people are when they with maddening superiority thrive to label and call name at others. Lovely review, Robin. I’d never have thought of getting an audio version of this book, but you make a strong case for it. Matt, I agree that this book is a wonderful lesson in humanity. It’s so beautifully written! CdN Reader, you have a wonderful reading experience ahead of you with this book. I enjoyed it long ago, but I loved it this time through. I look forward to reading your thoughts on it when you finish! Karen, I hadn’t intended to listen to this book when I decided to read it for the Southern Reading Challenge. But when I saw Sissy Spacek’s name on the audiobook version, I changed my mind. I’m so glad I did! It gave a lot of depth to the experience for me. Glad to hear that the audiobook is well done. I first read Mockingbird a couple of years ago and fell in love with both it and the film. This is one I’d like to get on audio sometime to listen to. Carl, the audiobook is an amazing experience! My husband and I are watching the movie tonight. It’s been many, many years since I saw it, so I’m wondering if I will like it as well as I did back then? The comments have said it so well. When Gregory Peck passed away I knew I had to have several of his movies. to Kill A MOCKING BIRD was first on that list. Now I want to listen to Sissy Spacek read it. Thanks, Robin. You said it so well. Thanks, Mom! You know that Gregory Peck is one of my all time favorites! OH I SO AGREE! I listened to the book this year rather than reading it (and i read it almost annually) and it was literally almost like a first read again for me. all the beautiful nuances that I missed in reading it jumped out when spoken in that soft southern drawl. Brilliant! T.P.D, that’s it exactly–the nuances were wonderful! This is an audiobook I could listen to again. I checked it out of the library, but I think I’ll have to buy a copy to share with family and friends, and for a relisten at some point. Thanks for your inspiring thoughts about this lovely book. The first time, I came in contact with the novel was when I listened to an audio version of “To Kill A Mockingbird” read by Sally Darling. This interpretation was really beautiful, too. Especially the voice she gave to Scout.